I am so excited to have Katie from Clarks Condensed sharing one of her slow cooker recipes on the blog today. Make sure you stop on over to her blog and say hi & check out some of her fabulous parenting posts and recipes! :) Ummmm... she may have JUST posted a recipe for an absolutely fabulous looking Crazy for Coconut Cake (and it is dairy free!). Clarks Condensed was created in January of 2013 by husband and wife, Forrest and Katie Clark. Their blog features a little bit of everything, from recipes and restaurant reviews, to stories and advice about pregnancy and parenting, and even current events (mainly from Forrest.) Katie is graduating in April with a degree in print journalism, and Forrest will also be graduating in April in political science. Katie is a stay-at-home mom, who loves spending time with their sweet little boy, Jack. 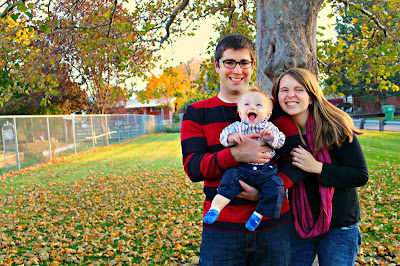 Be sure to check out Clarks Condensed, and connect with them on Facebook, Twitter, Google +, Pinterest, and Blog Lovin'. When we came home, my family was always greeted by the savory smell of something that my mom had put in the crock pot or in the oven. Some days I was hungrier than others, but without fail, the smells that permeated throughout the house would make me want to eat right then and there. Very often, the meal that was cooking was a pot roast. My mom always talks about how she can never seem to make the perfect roast, but I always thought hers were delicious. And whenever I'm really missing home in Colorado, I am sure to put a pot roast on the menu for that week. With my pot roasts, I'm always experimenting. I don't think we've ever had the same recipe twice. A few weeks ago I was at Smith's Grocery Store, and I stumbled upon a jar of peppery sweet corn salsa, and I thought I would try it out on our roast that Sunday. I'd never used salsa on a roast, but I thought it might be a nice combination. I had used Dr. Pepper awhile back on my roast, and I thought it made it especially moist. So I figured it wouldn't hurt to use it with this recipe. It cooked while we were at church, and about an hour after we got home, it was cooked to perfection. It was extremely moist and had a unique smell -- somewhat southwestern. It just fell apart when we cut it, and the gravy it produced was yummy as well. We did feel it was pretty sweet, so if you don't like sweet, I'd use water instead of Dr. Pepper. However, there was also a good amount of heat packed in that somewhat balanced the taste. We served it with a typical fare -- rolls and mashed potatoes -- and combined with the carrots, it was a pretty yummy and balanced meal. Thaw roast either overnight in the fridge, or in a bowl of warm water. 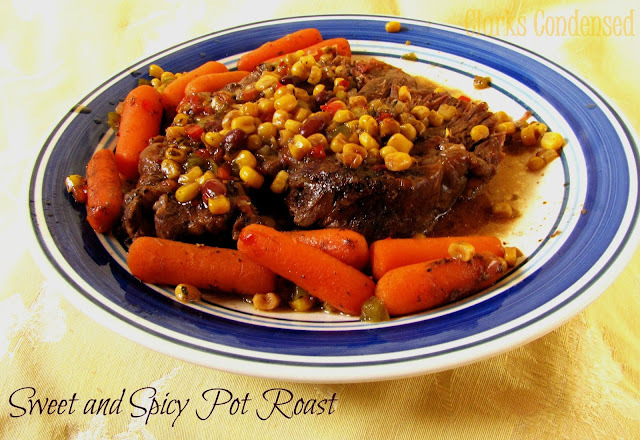 Place roast in slow cooker. Pour entire container of salsa, 1 1/2 cups of Dr. Pepper, and sprinkle Italian seasoning on top of roast. Arrange carrots around roast. This post was first seen on Clarks Condensed. Okay, so who isn't going to put this on their menu plan for the week?? Wow... Thank you, Katie for the amazing pot roast recipe! I pretty much love anything that you can throw in your Crock Pot, walk away from, and have a delicious home cooked meal a few hours later. Yum! Always exciting when a new recipe works out! Definitely have to add this to our "To Try" recipe folder! This will be a to do recipe! Thanks! First of all, I never should of come here hungry. This looks SO good! I have never used corn salsa in my post roast but will be trying this soon! Love it!